Celebrate Crafts: February SOTM "Home sweet home"
February SOTM "Home sweet home"
Welcome to our February Stamp of the Month Blog Hop! 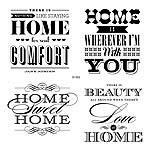 This month's stamp set from Close to My Heart is "Home Sweet Home" and is available exclusively through your Close to My Heart consultant from February 1 - 28, 2013. You can purchase this stamp set for only $5 with a qualifying purchase. If you came from Priscilla of Priscilla's Paperie then you are in the right place! For my project, I decided to make this "Home Sweet Home" wall decoration. I found a 4x6 wood frame from the goodwill that was unpainted for .99 cents. What a deal! I found some craft paint that I had purchased ages ago, that can be used to paint wood, terracotta, and other outside items. This color is barn red. I stamped the sentiment with Stazon ink onto cashmere card stock. You can't see it, but I added a few small pieces of bling on the swirlies. I made a flower out of burlap ribbon. This was not my design, I found a video on you tube by a sister consultant. You can watch the video HERE. I then added a button threaded with some of the burlap strings that I had pulled out of the ribbon when I made the flower. To adhere the flower, I hot glued it to the frame. I then hot glued the burlap at the top to create the hanging piece. Your next stop on our "Home Sweet Home" hop is "Traci " of "Paper Crafting 101"
Great frame....love the burlap flower! Great wall sign! The burlap ribbon really makes it! TFS! Great project Theo! Seeing lots of great gift ideas. Beautiful work of art. Love the stamp set.